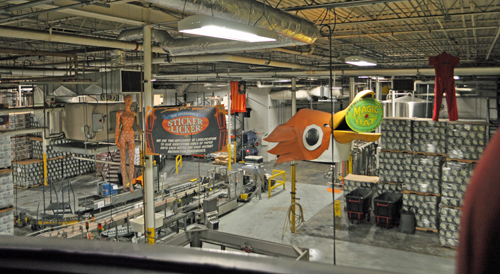 On a stormy Vermont Sunday we braved the wind and rain to see where that delicious elixir called Magic Hat #9 is made. Where else would you choose to wait out a hurricane? We did miss out on seeing much of Lake Champlain when visiting Burlington, VT last week we didn’t miss the breweries. Our meals included stops at American Flatbread (they brew some yummy stuff in back), Vermont Brewing Company and Magic Hat. Guess we know why they say Vermont is for Lovers. Magic Hat’s #9 is one the few brews that Josh and I enjoy equally, I think you’d be hard pressed to find anyone who doesn’t enjoy it. With a light, fruity yet complex flavor it has great broad appeal. The brewery offers free tours and tastings, we planned to come for one of the docent tours. The tasting room, halls and brewery are full of fun art and displays. It looks like a fun house and we did learn that they host tons of events at the facility. From an observation deck you can see most of the brewing rooms and bottling likes. 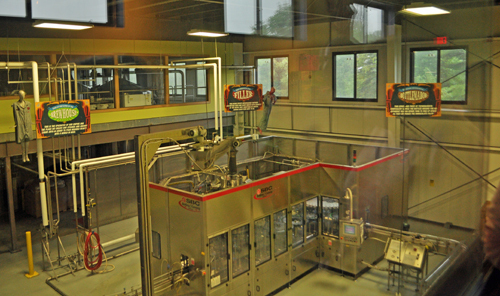 While it was neat to see such a state of the art facility looking at a highly automated brewery didn’t do much for me. 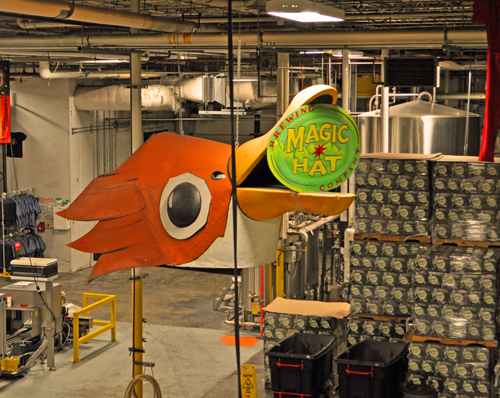 Magic Hat was sold in 2010 to a conglomerate called North American Breweries. Everyone has their own opinions about these sorts of deals. For me it’s all fine and good while the contract agreements still exist but one day the quality will start to slip and the brand will be put onto beer that is not really Magic Hat. Because of the storm they closing a bit early and we were rushed in experiencing the place. 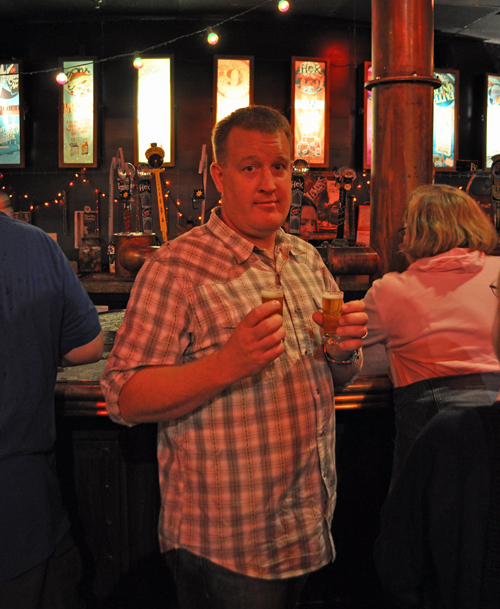 Of course we grabbed a few things from the gift shop but the beers to tap were ones all available in sample packs. It is possible I had way too high of expectations for this visit. This entry was posted in Beer and tagged Magic Hat Brewery. Bookmark the permalink. MMMmmm Magic Hat 🙂 I hope you enjoyed one for me!